IMMACULATE CONCEPTION HIGH SCHOOL Class of 1956 celebrates 50TH year reunion with other ICHS ALUMNAE at a two day event held in Markham, Ontario. As you travel down life's road"
These are the first two lines of the ICHS Glee Club Theme Song and they aptly describe what happened on October 14-15, 2006 in Markham, Ontario. Twenty three girls from the class of 1956 along with many other ICHS alumnae, husbands, daughters, relatives and friends came together to celebrate and recall good times from half a century ago. They travelled from Jamaica, The Cayman Islands, England, The USA: Hawaii, Florida, Washington, Maryland, New York, New Jersey, Rhode Island, Indiana, California, District of Columbia; and, Canada: Ontario, Quebec and New Brunswick. This was a very impressive gathering of "old girls" and their relatives and friends who came together to eat, sing, dance and reminisce. On Saturday we met at the Angus Glen Community Centre which had been decorated by the members of the planning committee with ICHS banners, maps to show the places where we have lived and our current residences, and most importantly pictures from our ICHS days. There was also some ICHS memorabilia for sale. 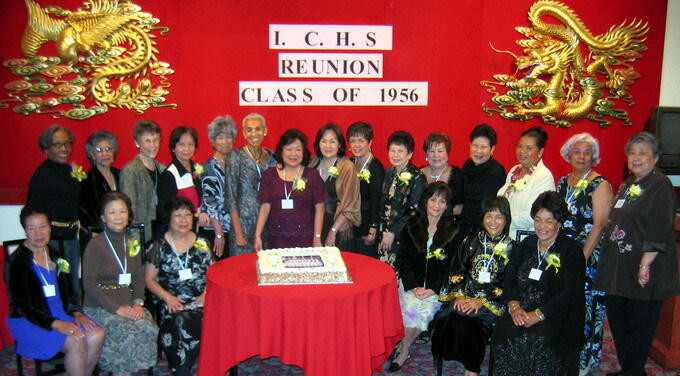 The theme of our reunion, Miss Lou's song "Long time gal me nevah see yu" was appropriate as some of us had not seen our former classmates for 50 years since we completed our studies at ICHS. It was heart-warming to view the pictures of our activities and fellowships at ICHS and to see our young selves and the aspirations of youth in our eyes. We were all so excited to be together that we started labrishing right away. MC Denise Narcisse-Mair Bishop got the event rolling with her entertaining stories and the introduction of the class of 1956. Roger Williams' Caribbean Kitchen catered a tasty Jamaican buffet of roast chicken, curry goat, jerk pork, rice and peas and salad. We also enjoyed cassava pudding, sweet potato pudding, cornmeal pudding and other desserts made by volunteers. Some of us went back for seconds. Did anyone go back for thirds? Leslie Chin added to our feelings of nostalgia with his excellent renditions of familiar folk songs. We observed a minute of silence and Leslie sang "You raised me up" in memory of Sr. Josette, who was one of the original planning committee members. The party continued with a big surprise when "Elvis" a.k.a. Clive Yap Sam entered the scene. "Elvis" was in the house serenading the grads and guests. Our video photographer, Cecil Hugh Sam, was kept busy taping "Elvis" and his adoring fans. There was a "whole lot of shaking going on." The toe-tapping music was provided by our DJ Clive Yap Sam. It was great to see us sexagenarians boogeying on down as we would have done at our many house and beach parties in Jamaica 5 decades ago. The cha-cha-cha was a favourite. Nicole Lyew won the door prize of an ICHS doll. Some of the grads were so excited that they could hardly sleep on Saturday night and were still talking about Saturday's event at breakfast and Dim Sum on Sunday morning. On Sunday afternoon we were fortunate enough to have a private mass in the St. Mary de Leuca Chapel. The theme of the mass was ecumenism and a reflection on Jamaica 's motto: "Out of many, one people." Jean Chen-Louise did the first reading from Wisdom 7:7-11. Laurel Yet Lam-Chin did the second reading from Hebrews 4:12-13. Angela Pereira-Kirkaldy led the prayers of the Faithful. We the students past and present as well as the sisters and teachers of our Alma Mater; for the success of our reunion; and, for peace in the world, especially in the Middle East. We prayed for the souls of all the departed ICHS students especially graduates form the class of 1956: Yvonne Beckford, Barbara James, Yvonne Chong, Sister Josette (Carmen Lee Sang) and Patricia Lyn. We prayed for the return to good health for Eily Chin and Lilly Mah Leung and also for those in need of prayers. Others prayed for safe travel and good health for ailing relatives. Gloria Richardson-Osgood gave thanks for her mom who insisted on her receiving the "ICHS" education that has nurtured, sustained and guided us for all these years. Leslie Chin participated in the mass and led us in the singing of uplifting hymns. The mass gave us a feeling of communion with our friends who were in attendance and good wishes for those who could not be with us. At the end of the mass we sang "Let there be peace on earth". After mass we went to the Century Palace Restaurant for a 10 course Chinese Banquet. Audrey Lee-Lue, our fearless leader, was the MC and she regaled us with her humour while circulating to all the tables to make sure that we all were having a good time. The dinner was delicious and leisurely so we had ample time to visit with our former classmates. Cathrine Sani the new President of the ICHSAA (Toronto Chapter) thanked outgoing President, Yvonne Lyew, for her excellent leadership. Cathrine introduced the keynote speaker, the Consul General of Jamaica, Anne-Marie Bonner a 1971 graduate of ICHS. The Consul General said she was honoured to be asked to speak at our celebration and she paid tribute to the excellent education that made us "special" Immaculate Girls. She also stated that her mission is to initiate many events that would include the richness and diversity of all the cultures of Jamaica and also to promote a positive impression of Jamaica and Jamaicans. She also said that she welcomes the idea of being of service to all Jamaicans in Canada. Audrey reminded us that there will be dancing after the speeches. Laurel Yet Lam-Chin thanked the Consul General for her speech. Jean Chen-Louise thanked the many volunteers and contributors to the success of our reunion. (Please see the list at the end.) In recognition of her strong, determined, resourceful, fun-loving leadership as the hard-working detective who left no stone unturned to make the reunion a success, the Planning Committee, on behalf of all the grads, presented Audrey with a bouquet of flowers. One of the highlights of the banquet was a special cake ordered by Laurel Yet Lam-Chin. The cake was decorated with a picture of the 1956 grads and all the grads were eager to have their group picture taken around the cake. The events of the reunion brought back many memories for us and an appreciation of how much we as ICHS grads have contributed to the quality of life we have shared with our families, friends and co-workers. During the banquet raffle tickets were sold for four baskets of groceries. There was a very generous response as the proceeds were going to be donated to ICHS on behalf of the alumnae present. Audrey Lue being presented by Laurel Yet Lam Chin along with organizing committee Yvonne Lyew, Sadie Wong, Jean Chen Louise and June Chong. Ina Williams missing. During both days addresses and phone numbers were exchanged and we should not wait for another fifty years to go by before we meet again. We ended the two days of our reunion with the song: "May the Good Lord Bless and Keep you" as we left the restaurant. As Miss Lou used to say "Walk Good"
Clive Yap Sam - Music by Sam & Sam Prod. We also thank Humphrey Lue, Gerald Lew, Eustace Chin, Trevor Wong, Eddie Williams who supported our efforts and worked behind the scene. Jean Chen- Louise, Laurel Yet Lam- Chin, Audrey Lee- Lue. 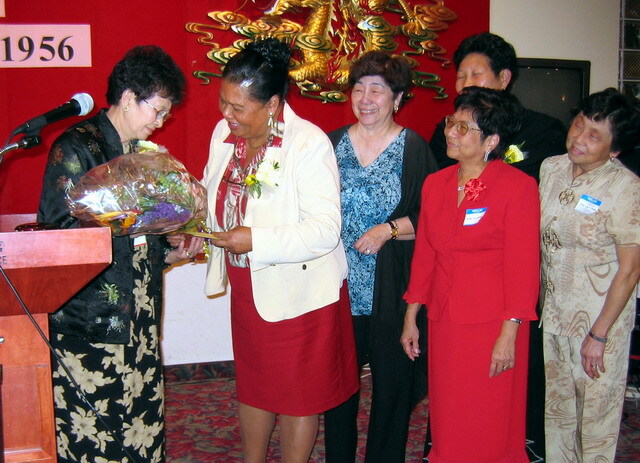 June Lyew-Chong, Yvonne Chung-Lyew, Sadie Lyn-Wong and Ina Yap-Williams. The feed back from the participants was that the reunion was fabulous. A phone call from a grad from Scarborough said "Boy, I never had such a wonderful time before. It was the first time in my life that I dance two nights in a row." A '52 grad from Ontario, who could not attend shouted to a '56 grad who had attended as they were going up and down the escalator at a mall. "I heard it was a great success"
A '56 grad from Washington called another grad saying "after 2 weeks I still on a high." "What a grand weekend - you, the organizing committee, and all others did a splendid job." says a '53 grad from Ontario. Thank you for allowing us to join the party. My husband loved it and would like to do the same for his class (George's). says a ' 62 grad from Ontario. CONGRATULATIONS ON GIVING US AN ENJOYABLE TIME ON SATURDAY AND SUNDAY. THE MEMORIES ARE VERY PRECIOUS. Says '56 grad from Florida. You and your committee did a marvelous job! Marty & I enjoyed every minute of the reunion, thanks to your efforts to pay attention to every detail. Thanks also for providing the email address of everyone here so that we can keep in touch. Wrote a '56 grad from New Jersey. You and your organizing group did a wonderful job having all these "senior" classmates at the reunion. It was a memorably two-night event...Thanks for inviting us to celebrate with you and the "gang"...!!!! And the Elvis skit as such a pleasant surprise too.....Encore...!!!! says a '55 grad from California. Many thanks for all the hard work. I thoroughly enjoyed every bit of it. Thanks for opening it up to all the ICHS graduates. Wrote a '57 grad from California. I would like to take this opportunity to thank all the members of the planning team who worked to make this reunion so successful and enjoyable for all of us. In my welcome speech, I said, "it is not what you know but who you know." Thanks girls. I must also give thanks to the One above. Happy New Year! This is the first issue of our newsletter for 2007 and we look forward to the New Year with great anticipation of all the wonderful things that are in store for us. 2006 was an active year for the association. In February, our Crystal Ball was held at Sts. Peter and Paul Banquet Hall, though comparatively small, was a great success - all good reports. Our fellow Alumna, Anne-Marie Bonner was appointed to the post of Jamaica Consul General to Toronto in April and we are happy to welcome her to Toronto and our association. July was an extremely busy month. We were visited by Sr. Maureen Clare, Sr. Grace Yap and for the first time we met the new Principal of our Alma Mater, Sr. Angella Harris. We hosted a luncheon in their honour at which we were brought up to date on the happenings at ICHS by Sr. Angella. We also thought that this was the perfect time to elect the new Executive Committee and floor members for the period 2006-2008 so we took advantage of the gathering as it is never easy to get a quorum. Our annual joint picnic (with Alpha and St.GC) in August warmed our hearts and our bodies as we had excellent weather and lots of fun as we rekindled old friendships and made new acquaintances. The Class of '56 invited us to COME CELEBRATE their 50 year reunion in October - Congratulations ladies - a job well done. We ended the year with our annual Mass and Potluck on December 3rd at St. Justin Martyr Church in Unionville. For those of you that missed it, we hope that you and your families will join us next time so that you too can partake in great food and enjoy the camaraderie of our ICHSAA family. The success once again was due in part to Yvonne's persistence in placing those calls to ensure that most of you would attend. Thanks to all who prepared the delectable dishes and soul food. Were it not for our potluck, some of us would probably forget how wonderful our Jamaican cuisine is. During our luncheon, we were informed of the typhoon that hit the Philippines causing devastation and homelessness. An appeal was made for donations of food, clothing and of course money. Anyone wanting to make a contribution can contact Phyllis Chen at 905 940 2606 We took the opportunity to seek cash donations at the luncheon and though the generosity of those attending, we raised enough money to build two huts. Way to go ICHS AA and family!! Our committee is working very hard on our dance that is being held on February 3rd 2007. We hope that you will all attend as it promises to be a "hot" event�. Latin Fever!! As we begin the New Year, I encourage you to become active members of our association by supporting our events, attending our meetings and paying your dues. I take this opportunity to wish you and your families a healthy and prosperous 2007. 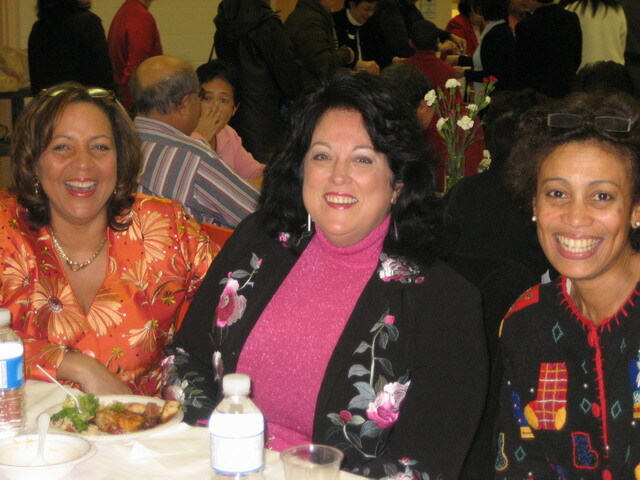 ICHSAA held its annual PotLuck Luncheon on December 3rd at St Justin Martyr Church in Unionville. Most attended Mass with the congregation, then assembled in the hall downstairs for a feast of rice and peas (three delicious versions this year), jerk pork and chicken (some with gravy, some without), mac and cheese, stew peas with plenty of spinners, a nice squash soup that hit the spot....... and lots of dessert including home-made nougat by Christine Chong. Yum. New president Kati Sani welcomed the crowd, and Ina Williams said grace. There was a little slide show of the October reunion, and a spirited announcement about the upcoming ICHSAA dance �LATIN FEVER�on February 3rd, 2007 at Sts. Peter & Paul Banquet Hall in Scarborough. So who all was present? Barbara Chang, a longtime (her mom and my apo were very close) friend of my mom and dad, stepped up to say hello; she came with sister Norma and sister-in-law Paula. Maria (Demercado) Schleifer and Dianne (Berry) Collins, both now in Oakville, reminisced about �discovering� each other at their neighbourhood church, encounters with Sr. Jimmy, and recipes for pumpkin/squash soup. Annette Wong floated her trial balloon decorations for the �Latin fever� dance, and caught me up with her grand-neice�s antics (her neice is my first cousin); she was sitting with Daphne Chung. Pauline Williams came without Tricia this time, but Tanya (Tenn) and Vernon Hugh had their two tall teenagers in tow. Miss Donns (Rutty) is now a big-time coordinator for CariBram, so look out! for another great event in 2007. Lily (Chin Fook) and Edward Mah-Leung and Joyce(Wong Chew-Onn) and Edward Chin were table mates with delighted raffle winner June (Lee) Fujimoto. The prize was a basket of goodies donated by �Irie�. There seemed to be a lot of ICHS �old boys� this time, for example accompanying Audrey Lue was Humphrey; Grace (Yap Chung) Chin with Nelson; Rose Chen with Bernie Chin; Adrienne Aarons with Gillie; Bev Lue with Franklin; Betty and Charlie Lue; Alison and Alicia Martin; Phyllis and Mike Chen....the list goes on and on. On November 13, 2006 Angela Patterson (Robinson) class of 1970, was also featured in the Jamaica Gleaner: "Angela Patterson- Gearing CPTC for the 21st century"
Bravo ladies - keep the ICHS flag flying high. Congratulations to G. Raymond "Ray" Chang -installed as new Chancellor of Ryerson University, Toronto last November, 2006. Ray is an avid and passionate supporter of education. His alma mater St. George's College honored him recently when he was installed into their Hall of Fame, late last year. He continues also to support other Jamaican high school alma mater projects including ICHS. He is an honorary Jamaica College (JC) old boy. Ray has also been named the Gleaner Company of Canada's "Man of the Year" for 2006. We are immensely proud of Ray and the works he continues to do for Canada and Jamaica. I was in Jamaica recently (again) and had a chance to meet with Sr. Angella and the head of the alumnae chapter in Jamaica, Janine Dawkins (history teacher, Mrs. Dawkins, daughter). Janine is a bright wonderful young woman - who informed me that I must have seen her mother pregnant with her because she was born in 1970...........of course I graduated in 1971 !!!!!! Janine is a PHD and works with the ministry of transportation, helping to decide the planning of street signage etc. in Jamaica. Sr. asked me to address general assembly and bring greetings from Toronto..........I did, holding back tears. I stood watching the sea of white and blue and the innocence of the faces of the young women to whom we have left this rich ICHS legacy and it made me so proud. It was surreal, and took me back to a time when we walked the fine corridors of Immaculate, when we marched upright, single file to the cafeteria (Sr. James Vincent shouting: "Get off the grass Suzie Q"), when it was a major event for members of the other gender to drive through our school and then boasted that they did. Janine and I toured parts of the school to see their needs. I'm pleased to say ICHS has withstood the test of time, structurally and its education standards, with a fine cadre of faculty members. However, the library needs A LOT OF HELP. It needs books, computers and other tools. We met with Duane the librarian and he's supposed to send me a list of their needs. 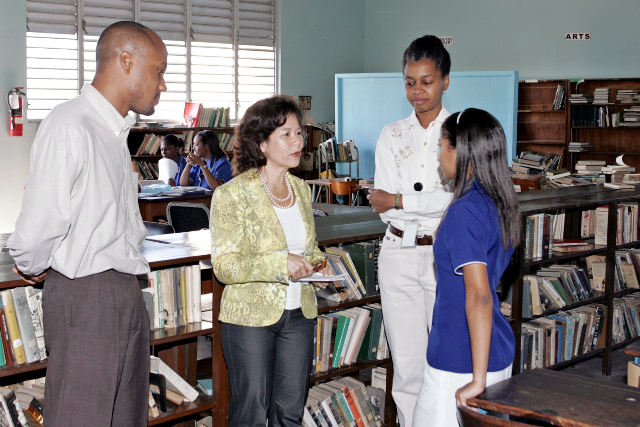 L-R: Duane Burke (librarian), Donette Chin-Loy (member of the Toronto chapter of the ICHS alumnae association) and Janine Dawkins, speaking with a student. We then took a stroll to the summer house, pass the pool where it was interesting to see that the swim coach is male............and of course more unusual for me were the number of male teachers. The roof of the summer house is in need of some repair, as is the ceiling which has mildew..........but the structure remains strong and in tact. Sr. Angella is a blessing. She is the right person for the times. She walks quietly and is very very effective. Next we attended a dinner / dance on the Saturday night. There were many familiar faces. The nuns (with Sr. Maureen Clare and Sr. Celia) had their own table. I saw Nadia, Thalia (Chang) Lyn was guest speaker; Angela Patterson (Robinson), Carol Anglin, Mrs. Dawkins, Mrs. Campbell, Jan Meanny and the list goes on. I was however disappointed by the turnout.......only about 100 people - including the alumnae assoc. members. ICHS graduates have made their mark everywhere. We are spread throughout the world now, contributing in significant ways to the communities in which we've chosen to live. I am proud to know that the present principal (first female ever) of St. George's College is Margaret (Van Hitchen) Campbell - class of '88. At the end of my tour I was leaving the upstairs balcony (overlooking the assembly courtyard), I looked around and got the most incredible AHA!!!! moment�. rising in the distance was the magnificent Blue Mountains, reminding me that were privileged and grateful to have attended a great institution. The assembly courtyard reminded me of the wonderful history made at ICHS, defining moments like graduations, assemblies and various other gatherings which took place in that space. Next year ICHS celebrates its 150th Anniversary. Janine mentioned they were looking for ideas as part of the celebrations. I suggest we establish an Immaculate Conception High School Hall of Fame. 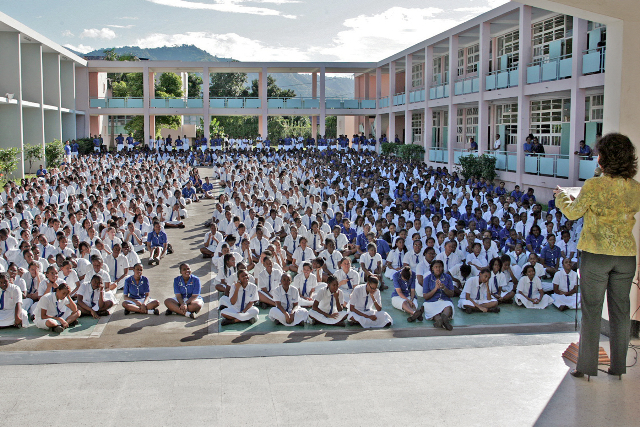 The older I get of course is the more I get back to "core' to the halcyon days at ICHS when life and growing up were simpler and gentler...........and indeed life in Jamaica. I am so proud to be an ICHS graduate.........to have met girls like you and to have inherited and left a legacy that will last a lifetime. I wish you all a happy, healthy and joyous New Year filled with lots of love and good food. Greg Lee, leaving wife Georgia, brother to Audrey Lue, Lorraine Moo Young (Miami),Denise Yap Sam; sisters Jean and Valerie Chin (Miami); brother to Patrick Lee. Adiran Levy, proud grandmother Jeanne Levy and son of Robin & Demetra Levy. Katarina Lee Sanz, born on November 29, 2006 6 lbs 10 ozs and 19 1/2 inches at birth- proud grandparentsJackie & Derrick Lue, Parents Melissa and Albert Sanz. Adeline Rainora Lue Sang, proud grandparents Joan & Ronald Chang. Parents Elinor and Ray Lue Sang. 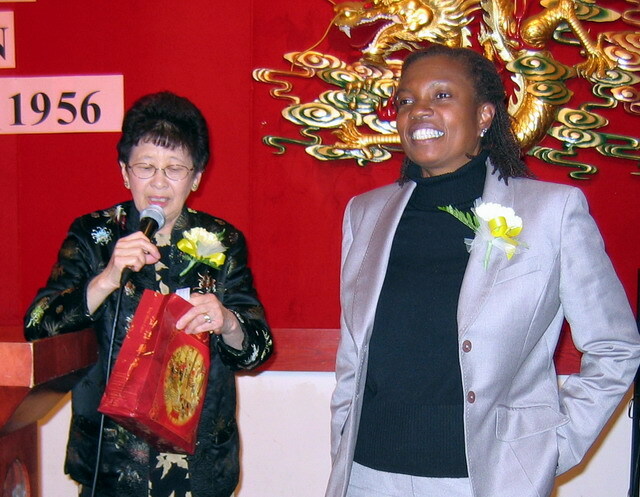 Remembering Sr. Mary Agnes Wong, O.S.F. The psalmist says: I will sing of your steadfast love forever, my Beloved; with fervent voice I will proclaim your goodness to all generations." This was Sr. Mary Agnes' constant refrain, her mantra, throughout life. Sr. Mary Agnes was born on October 23, 1920 and passed away several days before her 86th birthday last year (October 5, 2006). She was born Enez Wong, to parents Lily and Alfred. She came from a fairly large family and retained strong ties with her parents and siblings. She shared many stories about them, that it felt they also became "our family." Sr. Mary Agnes was received into the Congregation of the Franciscan Sisters of Allegany at St. Elizabeth Motherhouse on August 15, 1941 and professed her final religious vows seven years later. She was a graduate of St. Joseph's Teachers' College in Kingston. Much of her religious life was spent in the service of education, working at various schools throughout Jamaica and the United States, in various capacities - teacher, librarian, bookkeeper, and office assistant. Her single minded dedication to the mission gave witness to her commitment and devotion to her call as an Allegany Franciscan sister. From 1969 to 1984 Sister Mary Agnes ministered at ICHS as the bookstore manager, then as bookkeeper. ICHS students over the years were privileged to have met her and we each have a Sr. Mary Agnes story to tell. In 1984 she moved to the U.S.A., first to St. Joseph Convent in Niagara Falls, then to Archbishop Walsh High School in Olean. In 2000 Sr. Mary Agnes moved to St. Elizabeth Motherhouse and continued her mission of living the gospel through prayer and service as a Franciscan nun. In addition to the Franciscan Sisters of Allegany, she is survived by her siblings Colleen Chen; Fay Young; Louvette Carr; Eric; Lee and Keith, as well as nieces and nephews. The psalmist says: (119) "Lord, You welcome us home as honoured guests, back into the fold of Your Heart." We rejoice today, knowing that Sr. Mary Agnes rests in the Heart of her Lord. Sr. Mary Agnes we shall miss you but we take comfort in the knowledge that you are safe and home at last.